I never tire of gazing at bison in Yellowstone. I find them magnificent creatures and they are inextricably linked for me to a prehistoric time when 60 million of their ancestors roamed in endless herds across North America (one explorer noted a sea of buffalo that stretched 20 miles wide). In the winter I salute their tenacious survival skills, and smile when I see a bison "snow angel," the marks in the snow left from them brushing their head from side-to-side in search of sparse forage underneath. Somehow these 2,000 pound animals scratch out a living in Yellowstone's extreme winter by eating mostly dead plants--what we would consider the equivalent of munching on cardboard. May is my favorite time in Yellowstone, as bison give birth to what some visitors mistake for "little orange dogs." Although an adult bison can't really be described as cute, a bison calf is pretty darn adorable. Last year a bison calf was born in my front yard and another in the snow right outside my office. When my parents visited Yellowstone, they witnessed a grizzly bear take down a bison calf at Old Faithful-- and saw members of the herd brave the danger and go back to try and unsuccessfully retrieve the calf. And if one needs a further testament to the intrepid spirit of this remarkable animal, we need only recall the story (and look again at the photos) that went viral last year of a bison, badly burned from a fall in a hot spring, who still managed to outrun a hungry grizzly bear. On this blog, for the most part, I prefer to steer away from opinion and instead inspire others by simply sharing the wonders of Yellowstone. Yet when I read this evening that one of the test bison I had written about in my prior post was killed as a result of it not staying within the prescribed safe area, a profound sadness overcame me. Last week marked the beginning of what many heralded as a new era of bison tolerance on the northern range of Yellowstone when a test group of bison were released and allowed to roam outside the park boundary for the first time in decades. Yet not even a week later one of the herd is slaughtered for refusing to move from private property adjacent to the newly designated protection corridor. This has been a very snowy winter and even the lower elevations of the park near Gardiner have received above average snow. The bison was probably hungry and tired and had no conception that his quest for greener pastures would result in death. The punishment doesn't seem to fit the crime. Bison with ancestors who once roamed the entire continent don't perceive property lines, they see the world in terms of survival and migrate where they find a food source. So why was this bison shot? Allegedly to prevent the spread of brucellosis to livestock, although most sources I have consulted say there has never been a documented case of a bison spreading the disease to cattle. The Yellowstone bison are part our our national heritage, they are the last continuous descendants of the mighty wild herds of bison that once wandered our country. In the early 1900s, bison had dwindled from the 60 million animals that existed prior to the mid 1800s to less than two dozen hiding out in Yellowstone. In one of the most significant conservation measures of our time, the park restored the herd back to health, and today over 3,000 bison call Yellowstone their home. When confronted with the historical mass slaughter of the great bison herds, most of us express dismay. And although it was only a single bison shot this weekend, I feel the same sadness. Have we still not learned to cherish wildness and the specialness of wild creatures? If even one bison can't find protection in the last sanctuary for his kind, then we as a people may need to rethink our priorities. Yellowstone's bison leaving the park's northern entrance by Roosevelt Arch Photo: Beth Pratt This morning at the north entrance of Yellowstone, a steady stream of bison wandered down from the foothills below Sepulcher Mountain, strolled by the famous Roosevelt Arch, and marched beyond the park’s boundary into the town of Gardiner. Many camped out in the football field of the local school and grazed beneath the goal posts. Just over 3,000 bison live in Yellowstone National Park. In one of the most significant wildlife conservation measures of our time, the park built the Lamar Buffalo Ranch in 1907 to save the last 23 wild bison in North America, the remains of a population that had dwindled from 60 million animals. By the 1950s, the herd had grown to over 1,000, and in 1968 wildlife managers declared the population restored to health. Bison grazing on the football field of the Gardiner School (Photo by Beth Pratt)Yet the restoration of Yellowstone’s bison has not been without its controversy. 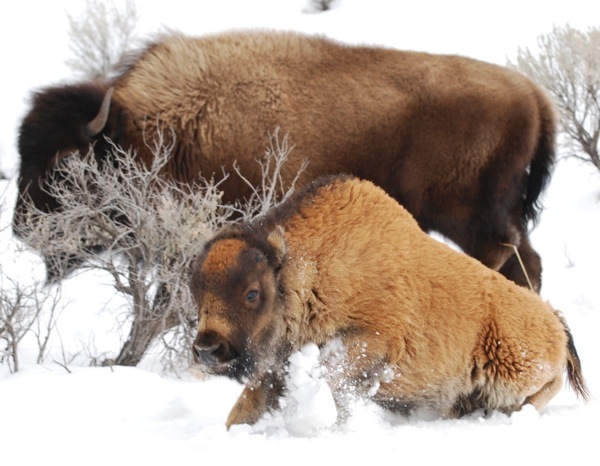 Bison migrate to lower elevations outside the park’s boundaries in winter in search of food. Because of the fear of the animal spreading brucellosis to livestock (whether bison spread brucellosis is another source of fierce debate), once bison cross the park boundary they are often hazed back into the park, or in extreme cases killed. Park management sparked criticism in 2008 when fifty percent of the park’s iconic herd—over 1,600 bison—was slaughtered. Last week, the first bison in decades were allowed to travel unhindered outside the northern boundary of the park in the Gardiner Basin. The Interagency Bison Management Plan, developed by agency partners, called for an experimental release of the bison this winter to assess the potential for allowing more of Yellowstone’s bison to access this winter range. In 2008, the Montana Department of Fish, Wildlife and Parks (FWP) secured 30-year grazing rights for the bison in this area with a $3.3 million deal with the Church Universal and Triumphant. Payments for the fee come from FWP, the National Park Service and non-profit conservation groups. As this year serves as only a test for the new migration corridor, the dozens of bison wandering outside the park this morning will likely be hazed back if they travel too far in search of forage. And the test group of bison still risk being killed if they travel beyond the newly protected area (as half of them did the day after being released and had to be herded into safe territory). Despite the recent progress, for Yellowstone’s wild bison the ability to roam freely still remains an uncertainty. A late bison calf and his mother nap in the snow in Yellowstone National Park Photo: Beth PrattAlthough most of Yellowstone is blanketed in snow after the recent series of storms, visitors to the park's north entrance have been stopping to photograph a bright splash of orange against the white landscape. The source? A fuzzy bison calf born late in the season. Bison babies don’t resemble their parents at all—although adult bison are magnificent creatures, it’s a stretch to call them cute. But bison calves are pretty darn adorable. The starkly different appearance of the calves from the adults—especially the brick red color of their coats—has caused some park visitors to ask about the “little orange dogs” running with the bison. A bison usually gives birth in late April through May to one calf (twins occur occasionally) after a nine and a half month gestation period. For the first few days, the calf spends most of its time resting, but soon becomes energetic enough to explore its surroundings. The orange-reddish coat typically fades after about ten weeks, gradually darkening until it transforms into the dark brown hue of the adult bison. As this little calf was still sporting the bright color, he must have been born late in the fall. Winter is a rough season on wildlife in Yellowstone—especially the young—so the late birth of this calf puts it at a disadvantage. Visitors and park employees are rooting for the calf to survive the winter. Visitors can look for the calf when visiting Yellowstone at the north entrance gate and on the road between Gardiner and Mammoth Hot Springs. For more information on bison, visit the Greater Yellowstone Science Learning Center. The Yellowstone River meanders gently through the soft, verdant grasslands in Hayden Valley. Wildflowers color the hillsides and cumulus clouds lazily drift overhead. This pastoral setting is the perfect place for romance—even for bison. Approximately 3,000 bison call Yellowstone home, and in late July through August every year they journey to the two primary breeding grounds in the park, one of which is scenic Hayden Valley. Bison bulls, who remain solitary or in small bachelor herds for most of the year, seek out females during the rut by grunting, bellowing, wallowing, and fighting with the competition. Visit my Examiner page to read the full article and view a slideshow. The last couple of weeks I have been traveling in a mad rush around Yellowstone as part of my work, but I made time for capturing some springtime photographs. My quest in Yellowstone today--a search for the boreal chorus and columbia spotted frogs. I ventured out to Lamar Valley and wandered around dozens of wetlands and ponds. Those little guys remained elusive--at least by sight--as I listened to the distinctive call of the chorus frog at several ponds. Despite the lack of frog sightings, my travels in the park were not in vain as my photo diary below demonstrates. I encountered five grizzly bears, observed bighorn and bison mingling, watched a red-winged blackbird bathing, and an osprey fly over the Lamar River. I also spent a delightful hour watching the most adorable bison calves play together--you can view the video below, but beware as you may overdose on cuteness! John Muir wrote, "A thousand Yellowstone wonders are calling, 'Look up and down and round about you!'" Being lucky enough to live and work in the park, I experience these wonders on a daily basis. Today was no exception. On my drive to Old Faithful, I witnessed adorable baby bison nursing and a mighty grizzly scrounging for food. I took some photographs and video to share (please excuse my poor filming skills--it was freezing and very windy!). This morning a bison gave birth in or near my front yard on the north entrance of Yellowstone. Although I didn't get to witness the event, my wonderful co-workers captured the newborn in some photos for me. Living in Yellowstone affords us some remarkable experiences--truly everyday in this park is a gift. Adorable is the only word that describes this little guy (or gal). So begins the season of cuteness in Yellowstone. 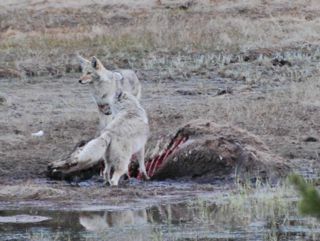 Spring brings bison calves, Canadian geese goslings, wolf pups, elk calves, and bear cubs. It's hard not to overdose on cuteness here! Bison Newborn in SnowJust another day at the office. A bison rested with her newborn calf behind the Mammoth Hotel today, close enough that I could watch the pair from my window. This is the first calf I’ve observed this season—last year I delighted in watching their antics while they frolicked in meadows throughout Yellowstone. Bison babies don’t resemble their parents at all—although I find adult bison magnificent, it’s a stretch to call them cute. But bison calves are pretty darn adorable. The calves stark difference in appearance from the adults—especially the brick red color of their coats—has caused some park visitors to ask about the “little orange dogs” running with the bison. Bison and Calf in Mammoth Hot SpringsA bison usually gives birth to one calf after a nine and a half month gestation period; twins occur occasionally. For the first few days, the calf spends most of its time resting, but soon becomes energetic enough to explore its surroundings. The orange-reddish coat typically fades after a month, gradually darkening until it transforms into the dark brown hue of the adult bison. Yesterday at the north entrance of Yellowstone, I watched from my front porch as staff herded some wandering bison back within the park boundaries. I made a quick video of the round-up. BIson and Calf Hanging Out Near My Home, April 2008Last year bison frequented my neighborhood in the late winter and spring, the long winter driving them to the limits of Yellowstone’s northern range in greater numbers than usual. Bison would sometimes peer into the window of my home, and bison calves frolicked and napped in my front yard. I have missed the abundance of bison visits this year as the lighter snowpack made it easier for the animals to obtain food in Yellowstone’s interior. Overall, it’s been a better year for bison. The harsh winter last year forced a large number of the animals to migrate outside the park boundary, where they risk being slaughtered. Nearly fifty percent of the park’s iconic herd was lost last year—with over 1,400 being shipped to slaughter. This year, park management has not had to kill any animals leaving the confines of the park. This evening, a herd of bison marched in front of my house, perhaps trying to escape this abrupt snowstorm that interrupted a week of beautiful spring weather—below is a short video of the herd. On the way home from Old Faithful today, my co-workers and I witnessed a lengthy line of cars that stretched nearly five miles past the Madison junction; in Yellowstone this is referred to as the infamous “bison jam.” A large herd of bison marched confidently on the paved road, some peering curiously through our car windows as they passed. The calves--some just beginning to sprout the first sign of horns--trotted and played among the adults. Old Faithful may be the most popular part of Yellowstone, but it's tough to beat the Lake Yellowstone area for spectacular scenery. Yellowstone Lake, the largest lake in North America over 7,000 feet in elevation, is 20 miles long by 14 miles wide, and its deepest spot is 410 feet. Numerous mountains, such as Avalanche Peak, guard its lengthy shores, and its waters create a blue sky on the ground. Although regular readers of this blog may recall my fondness for swimming high mountain lakes (Tenaya Lake in Yosemite for one), I won't be freestyling in Lake Yellowstone anytime soon--due to its extremely cold water, I would have a survival time of about 30 minutes. Scientists have been surveying Lake Yellowstone since the late 1990's. While mapping the bottom of the lake, they have discovered some spectacular features similar to hydrothermal structures found in the deep ocean. One such type of feature is the spire, a silica structure formed by the cooling of hydrothermal fluids rising from the lake bottom. The US Geological Society estimates that some of the spires may be more than 11,000 years old. Springtime redux. After two weeks of daily snowfall, the sun decided to make an appearance and there was much rejoicing. Green suddenly reappeared on the landscape, the color almost blinding to eyes used to pale white dreariness. As we drove into the Upper Geyser basin, we encountered a bison herd along the Firehole River enjoying the sun’s warmth. A bison calf strolled on the velvety grass, looking a bit dazed. Perhaps this was his first glimpse of the sun given the long winter we've experienced. A great photo of a typical bison jam in Yellowstone--gridlock bison style! And I couldn't resist sharing some more cute bison calf photographs.